Int. Sirkeci Train Station - 100 m.
Int. Sea Port - 1 km. Public Sea Ports - 300 m.
Nearest Tram Station (Sirkeci) - 150 m.
Ataturk Airport - 20 km. Istanbul Airport - 42 km. Sabiha Gökçen (SAW) Airport - 49 km. National Coach Station - 7 km. Please mail hello@neorionhotel.com for transfer fee and arrangements. 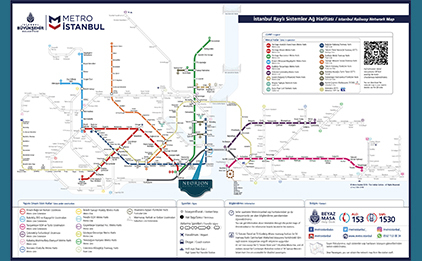 Take metro from the airport to Yenikapı interchange station, and then Marmaray line in the direction of Ayrılıkçeşmesi. Your stop is Sirkeci. 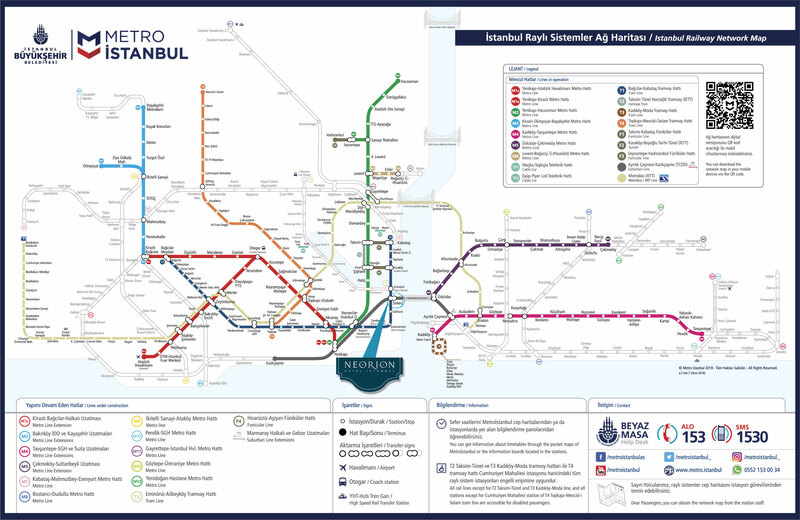 We are very close to Sirkeci Marmaray station (about 100 meters) It takes about 60 min to get to the hotel; Railway system operates from 6 AM until midnight. By using hotel transfer it takes around 90 minutes. Take a Havatas shuttle from the airport to Kadıköy and then a ferry to Eminönü. Then you may take a tram in the direction of Bağcılar to Sirkeci stop. It takes about 2 hours to get to the hotel. You may take a taxi from the dock; It takes 10-15 minutes. 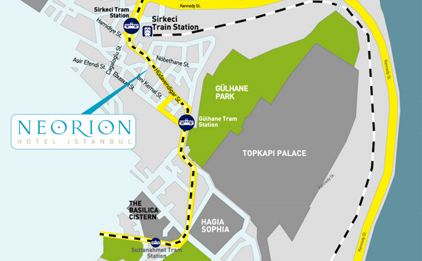 Walk to the tram stop in Tophane and board the tram in the direction of Bağcılar. It takes about 15 min. to get to the hotel. Tramway runs from 6 AM until midnight. You may buy single-fare tokens (jeton) at the Jetonmatik machines or snack/newspaper kiosks at the entrance to metro stations, tram stops, ferry docks.